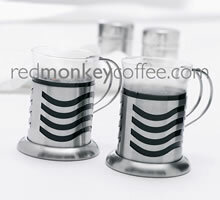 La Cafetière at Red Monkey Coffee.Com - We stock the full range of La Cafetiere products, we stock all sizes and colours of each range so you can convieniently order any item. La Cafetière is the last word in coffee sophistication from the designers and manufacturers of THE original quality French-press coffee makers and accessories. General Notes: Beakers are made of glass. Spare Parts: Replacement beakers & parts available click here. 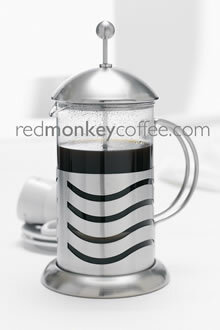 Modern Wave design cafetiere, with satin stainless steel finish and a heat resistant glass beaker. Available in three sizes. Matching latte cup sets and standard cup sets. Focussing on a modern, contemporary design, Santos features a satin finish stainless steel holder with fashionable spots. Available in 2 sizes. Standard cup sets.